Last week, I went in for my BaxAura appointment, to see how I was doing. My allergies are very minimal now, thanks partly to the weather being rainy (although others are still complaining about allergies) and partly due to my homeopathics actually working. My polarity was just fine this time around, and my allergies are very minimal. She ran my bottle through the machine and told me to finish it up and I didn't need to make another appointment unless I felt the need. I seem to be doing pretty well with the gut healing, Gluten-free eating. Unfortunately, I ate something this weekend that did not agree with me, and it's taking a few days for my system to recuperate. So many places to watch for Gluten when it's not all under one's control/in one's own kitchen! Aah! Also, I have slacked off on drinking my kefir daily, AND had a few cups of coffee last week that weren't really doing me any favors. How quickly I forget...(but it *was* great coffee!)... And on top of this, spicy food is not my buddy either....my poor gut! SO...As of this Monday, I am back on the Gluten-free thing, after my unintended "test" on Sunday. I am drinking homemade Kefir daily (which goes a long way in how I feel and how my gut deals with what I eat), and have made myself a huge pot of beef soup based on the GF Creamy Chicken Noodle Soup recipe I posted recently. Bone broth is also my friend. :) And taking digestive enzymes certainly aren't hurting anything! I love the rich, earth taste of mushrooms in a homemade soup or stew. 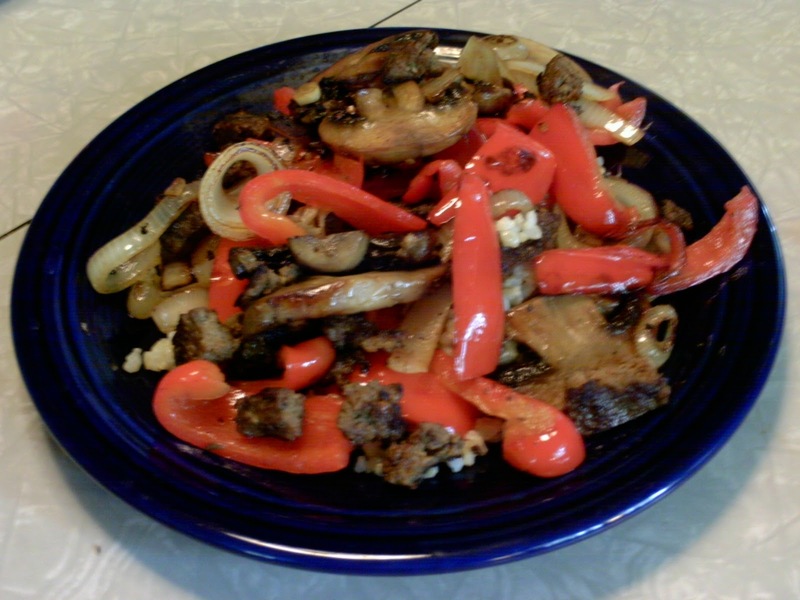 Canned mushrooms are just not the same as fresh, and sometimes fresh mushrooms aren't the easiest thing to have around all the time. 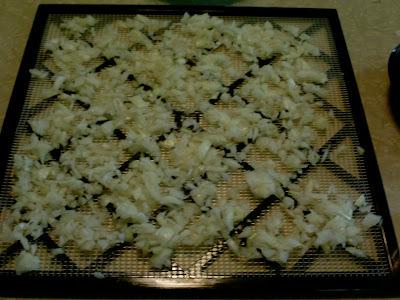 So, I'm dehydrating 3 containers' worth of Baby Bella mushrooms I got on sale last week, and since I have two extra trays begging to be filled (and I'm using the electricity anyway), I also chopped up 2 onions and put them on to dry! 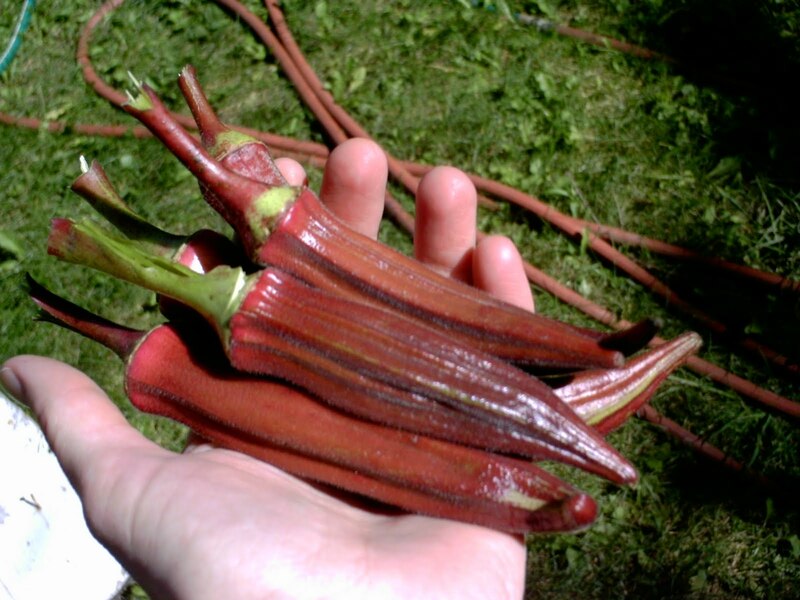 They are also great for use in soups and such! 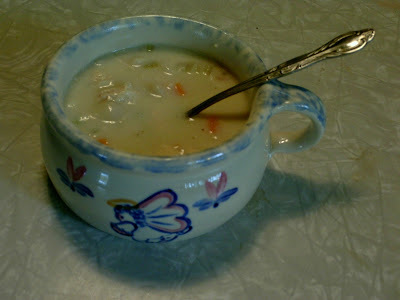 Last year, a dear friend brought over a pot of Comforting Chicken Noodle Soup, a recipe from Taste of Home's Quick Cooking. I decided to try re-vamping it and making it Gluten-Free and see how it turns out. 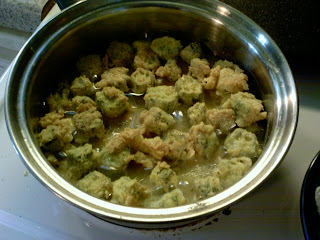 In soup pan, pour in oil and saute veggies. Add chicken stock, water, and peas and carrots and bring to a boil. Add noodles and cook, uncovered, until tender. Do not drain. Add soup and chicken. Heat through. Having a head of cabbage hanging out in my fridge, and a bunch of ground beef in my freezer, I pored through my cookbooks yesterday to come up with a new-to-us recipe that sounded good. In my Better Homes and Gardens Biggest Book of Slow Cooker Recipes, there is a One-Dish Dinners section that has the recipe for Mu Shu-Style Beef & Cabbage Wraps. This was my starting point and inspiration. ~1/4 cup GF Hoisin Sauce (more or less to taste) From what I read online, Dynasty brand is GF, as is Kame brand. Or you could make your own, but I haven't tried yet. 2. Pour oil into pan, along with beef, onion and garlic and brown. 3. 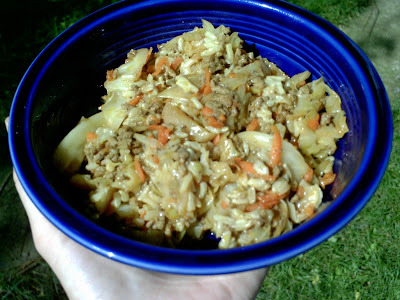 Add shredded cabbage and carrots and cook, stirring ever so often, until tender. 4. Pour Hoisin Sauce over meat/veggie mixture and stir to combine. Heat through. 5. Serve over Brown Rice. Here's my bowl with the rice mixed in! Everyone but my suspicious-of-new-and-different-foods second child ate this with no complaint. Hubby even had seconds and is taking leftovers for lunch today, and there's enough for lunch for two later this week! I think this one is a keeper. ~GF Creamy Chicken Noodle Soup (recipe to come tomorrow! Does it Really Cost More to Eat Healthier? When faced with information showing that people in lower income brackets tend to have more health problems than people in higher income brackets, the comment is often made that this is because the poor can't afford healthy food. That they must resort to cheap, processed "filler" food to feed their families because "Healthy Food is Expensive". I realize that there are areas in the United States where there are no grocery stores available, and without the means to drive out of their neighborhood, the people living in these areas are forced to eat from convenience stores/gas stations and fast food joints. This is what has been termed as a Food Desert. The available "food", while it fills the belly, is not good for the body and everyday consumption is not promoting good health. The problem here is Availability, and not Cost (because we all know convenience store food is not cheap!). Another slant that is not altogether included in the topic of this post is the specific issue of food allergy/intolerances/sensitivities. 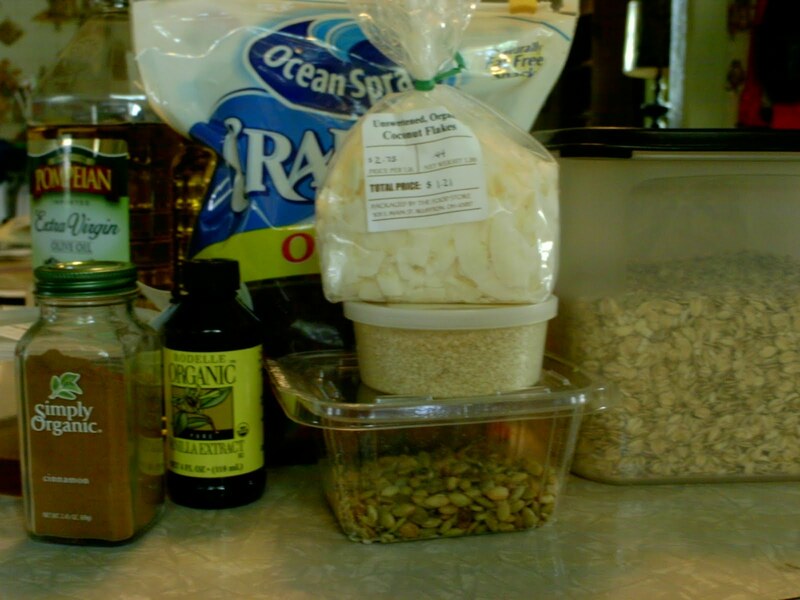 I know from personal experience that food allergies and avoiding food allergens (particularly ubiquitous soy and corn) wreak havoc on the food budget. This post does not necessarily include those avoiding corn and soy (and whatever else), but still, some points may be taken from this and later posts to help cut the food budget. After all, it's partially those allergies that were a driving force to get me to where I am today. I would like to present the idea that, given a handful of grocery store/food retail options, it doesn't have to cost more to eat a healthier diet of Real Food. Anyway, so far this month, I am on track. I will be honest and say that some months I do go over my goal. Still, I don't usually come very close to the Thrifty Plan spending, so I think we are still doing well. I would like to share my methods of trying to stick to my goal in future blog posts. Coming in later to add: I came across an article on WiseGeek today by an author that explains how her family does much the same thing! Thought I would share! Since the weather has turned cool, my outdoor potted plants are looking rather scraggly. This is the time that I decide what plants I actually want to keep around for next year, and act accordingly. 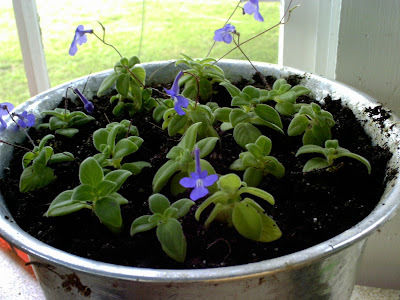 I have had luck in the past with wintering over geraniums, succulents, and Streptocarpella plants (thus reducing my Springtime Flower-Shopping bill), so here I will tell you how I do it. It's somewhat a game of chance, but I think that's pretty much a given when one is working with plants. 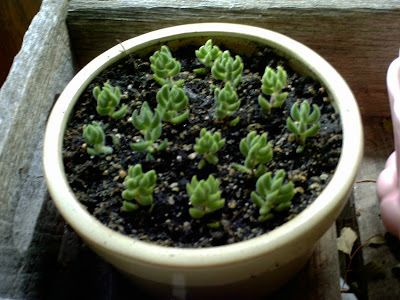 See how tall some of them get, and how some of them straggle out of the pot? I try to fix that. 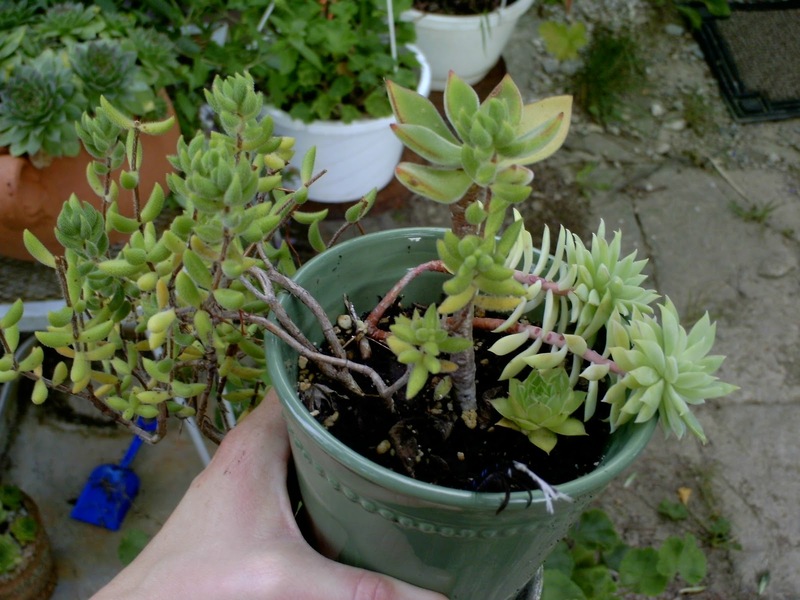 It's really as simple as snipping off a piece of plant that looks good to you, pulling off the leaves on the part that will be going in the dirt, and sticking it in the dirt. Done. Here's a few pots that I have done and are ready for wintering over at home. I did move them into my sunporch rather than outside, so as to help them not to be overly stressed by the cooler nights outside during this transition phase. 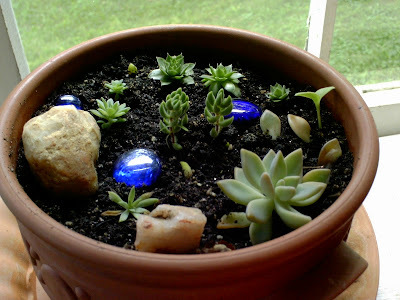 This is my little "Colorado Pot"...because those rocks are from CO! Geraniums tend to be a more trial and error sort of thing. Two falls ago, I rescued my MIL's hanging geraniums that she was going to throw out . I cut them back to about 3 inches high (making sure to leave some of the "knobs" where the leaves grow from and some leaves) and put them on a shelf in our cool unfinished basement. 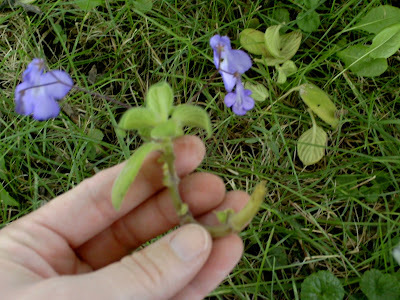 They started to grow some wimpy leaves by springtime, which I figured was a good sign they were alive. A few weeks to a month before it was safe to put them outside, I put them on my sunporch where they could get sunlight (yet not be shocked by direct sun) and be protected from freezing overnight. Then I put them outside and stuck a few of those fertilizer sticks in the dirt of each pot and was good to go for the summer. I did this for two summers with the same plants! This fall, though, I think it is finally time for the original plants to retire. But that is ok, since I have other plants I propagated off of them! Which brings me to the other method of propagating Geraniums. One way to do it is to cut off a geranium stem below a "knob", leaving enough stem to go into the dirt and enough to give you a plant above the dirt, pulling off all the leaves that will be going into the dirt, and putting this into water for a few weeks until you get roots and then plant them. But I get impatient. Last year, an acquaintance was getting rid of a lot of her pots (and potting soil) and I took advantage of the opportunity as an opportunity to try a different method. 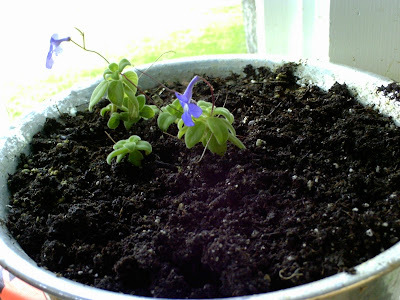 All I did was cut off the geranium pieces, pull off the leaves, and stick them into wet soil. Some of them dampened off and died, but most of them grew and I even got blooms from these plants through the winter. So, this is how I am doing it again this year with most of my geraniums. I would suggest that you only have about 2-3" of plant above the soil, as the plants will get leggy by spring if they are much taller than that. The Streptocarpella is one of my favorite plants. I believe it is a relative of the African Violet, and as such it does not like its leaves to get wet. It takes a little more care in watering than the other plants do, but the hummingbirds like it, and I love the purple flowers and the soft velvety leaves and hanging habit. remove leaves, and stick into the dirt. Make sure to put plenty of them in, as some likely won't make it. Also, try not to have leaves in direct contact with soil if possible. The more contact the leaves have with moist soil, the more leaves you will end up pulling off and discarding later. As with the succulents, I have my "new" Streptocarpella plant in the sunporch to offer more protection from the elements through this transition time. It's that time of year again! The weather is cooling, and I am starting to crave hot bowls of yummy goodness. Late last week, I was feeling like I was coming down with something. I made Turkey Veggie Soup, but I also made up a pot of what I have dubbed Healing Dahl Soup. It's thicker than soup, but has a warming spiciness to it--and it contains many ingredients that are known for helping the immune system to fight illness. Thankfully, my cold only lasted a few days this time! 1. Heat oil over medium heat in large frying or sauce pan. 2. Saute onion, garlic and spices together. 3. Add water and lentils and bring to a boil. 4. 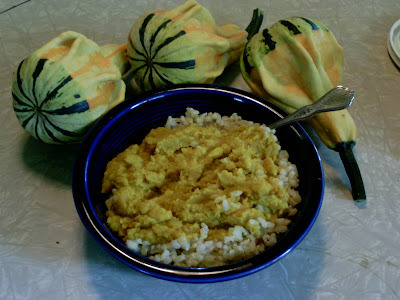 Reduce heat to low, cover and simmer until lentils are tender, about 45 minutes. Stir ever so often. 5. Remove cover, add lemon juice and simmer over low heat, stirring frequently, about 20 minutes or until lentils are mushy and thick. Add the salt. 6. Serve over rice, if desired. I generally serve it over brown rice. ~Sauteed Mushrooms, Red Pepper, Onion, 2 cloves of garlic, 1 hamburger...over Brown Rice ---Yummy! Note to self: I need to drink more water--was feeling that at the end of the day! ~Fried Okra-fresh from the garden! Fall is in the air. Mornings are chilly, and the garden has been beckoning me to come see what needs taking care of before the Big Freeze. 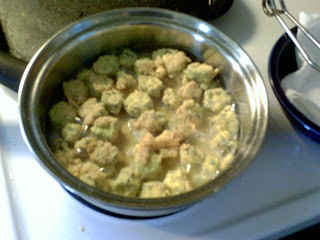 ...and decided that I was going to have Fried Okra for part of my lunch today! I suppose this isn't a true recipe, with exact amounts and such. It's how I "just do it" though, so thought I'd share. First I rinsed them off and patted them dry with a towel. 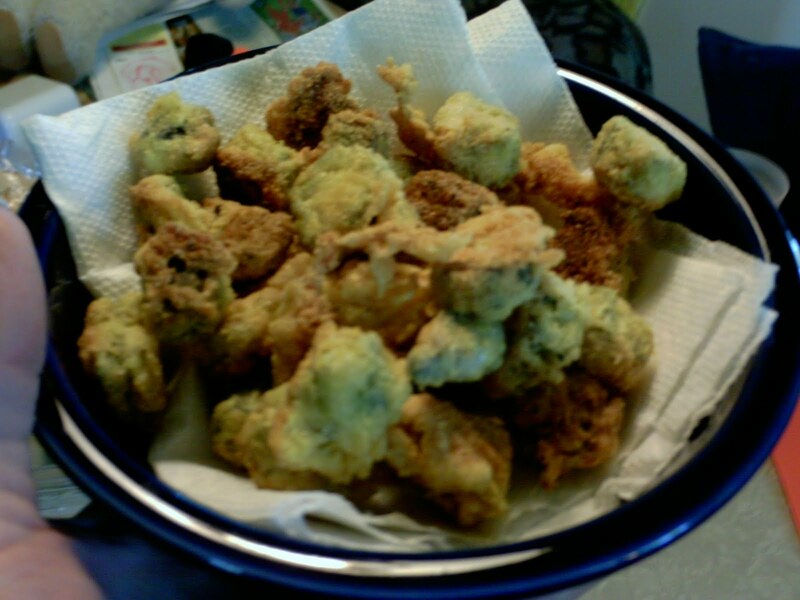 Dipped them in egg and put them in a baggie with about 1/2 cup organic corn meal, salt and pepper, to coat. turning when the underside was browned. I took them out to a bowl with a paper towel in the bottom to catch excess oil. I went on a baking frenzy yesterday and as I was baking for the whole rest of the family, I really kind of wanted some sort of yummy treat for myself. Awhile back, I made Chocolate Chip Cookies for the kids, only I didn't want to deal with all the making-of-the-cookies. 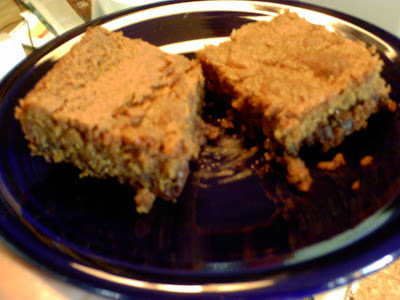 I pressed the Dough in my Pampered Chef 11 x 17 baking sheet and baked it 20-25 minutes or so. This went over well with the kids, and it took a lot less time/trouble to make. So....I figured I would try this same basic recipe out and sub the GF flour I've had on hand. Mix dry ingredients (minus the chocolate chips) and set aside. Cream the butter and sugars. Add the vanilla and 2 eggs and continue to mix. 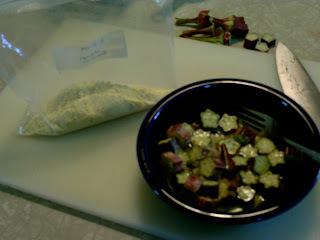 Add your flour mixture and mix until combined. Gently stir in the chocolate chips. Press/Smooth into a pan. 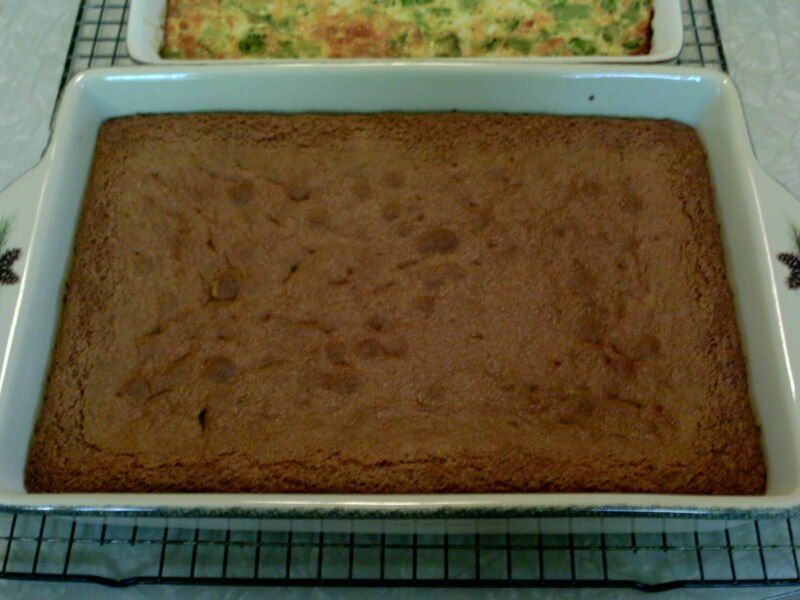 I used a 9 x 13 pan this time, but I think the 11 x 17 would have baked up even better. Experiment and see which way you like it best! Bake 20-25 minutes if you are using the larger pan. 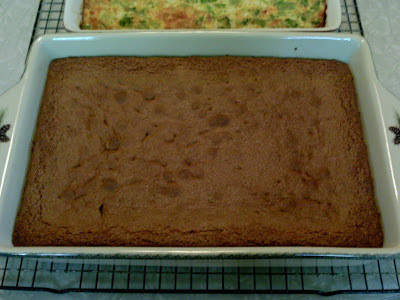 If you use the 9 X 13 pan, you will need to add additional minutes due to the thicker cookies. Remove from oven when browned on the top and not wobbly in the center. 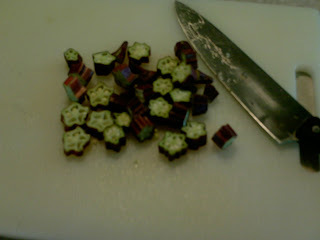 Cool, and cut into squares. Note: Mine turned out a little more crumbly than regular cookies, but they are oh-so-yummy! I would like to keep track of what I am eating, both to help others who are on a similar diet and might need ideas, and to rein myself in on days that I just want to eat-eat-eat! Today, this is what I'm eating. I will be adding as the day goes on. ~Omelet made using pastured butter in the cast iron pan, 3 local pastured eggs, and a couple pieces of Muenster cheese. ~Cup of hot PG Tips Loose Tea , with local honey and Coffee-Mate Natural Bliss (this was way too sweet!-didn't think about the added sugar when I put the honey in at first...) I picked up the Natural Bliss at the grocery because it was the closest I could get to half 'n half without the nasty throat-burning additives in most half 'n halfs.. Ingredients are: nonfat milk, heavy cream, sugar, natural flavors. Not sure what the natural flavors are/contain, but I don't get the throat/gut issues with this product...worth the risk, but not sure I will choose it over whole milk next time. So she ran the computer test while I was holding the metal rod. 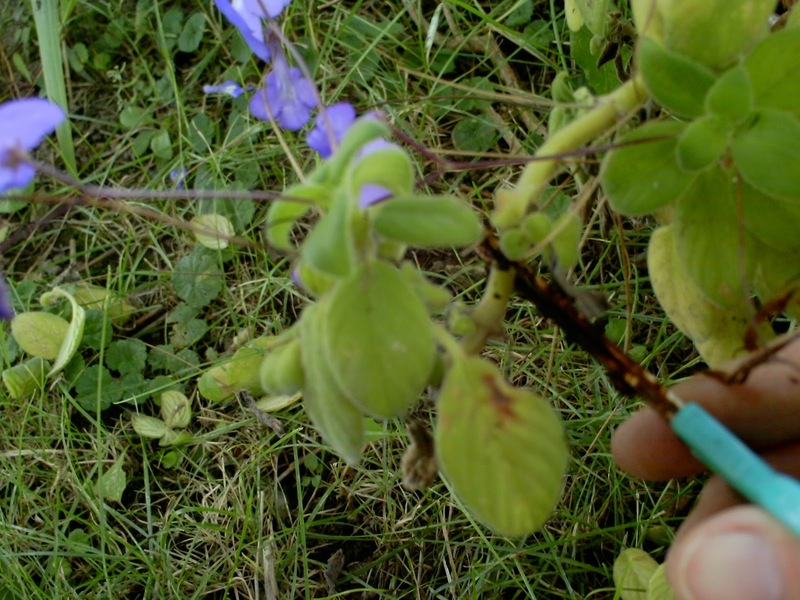 Still fighting with Chenopods (not Ragweed or Nettle) and the ileocecal valve<--I suspect this might be related to my cycles/hormones, though I didn't ask. Weird. Apparently, people who have problems wearing watches because they run the battery down so quickly have problems with their polarity as well. "Normal" polarity has one side of the arm with a positive charge, and the other with a negative charge, but the people with polarity issues will have the same charge on both sides of the arm. The phenomena of the full moon causing lots of people to end up in emergency rooms is also related to this polarity thing. It sounds sort of "out there" to my ears, but knowing that our bodies operate using electric charges, I suppose it's not a wholly "supernatural" thing. Just out of curiosity, the doc is going to look back and see if anything significant occurred around August 17 as far as the earth's polarity, the time this year and last year that my allergies really started acting up (and quite close to the same time the years before). I believe she is also going to contact the BaxAura people to see, if I am having problems with polarity, whether my body will know what to do with the homeopathics, which operate with polarity/specific charges. 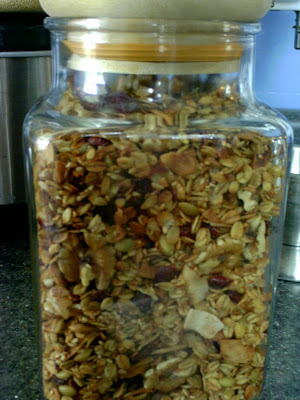 I decided to make some Gluten-Free Granola. For the record, most Oats are NOT Gluten-free due to cross-contamination issues in the field, on farm equipment, and in the grain storage and processing facilities. To make truly gluten-free oatmeal and granola, you really do need to seek out oats labeled Gluten-Free. I figured the cost of standard Walmart-brand Old-Fashioned Oats to be about $0.95/lb. Gluten-free Oats from The Food Store are currently $2.19/lb. I am not sure this is a fair comparison; maybe I should have compared to the cost of Quaker Oats for a more fair comparison. I will have to look next time I am in the store and report back. I adapted a recipe from a cookbook my husband picked up from a semi-local coffee shop. It's called The Basics and More Cookbook and my copy was printed in 1999. 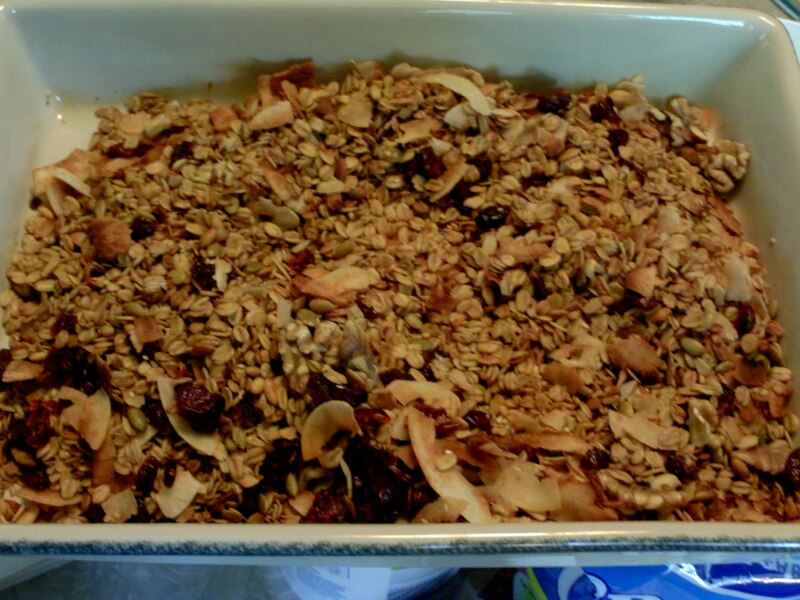 The recipe I adapted mine from was called, simply, Granola I.
Preheat oven to 350*. 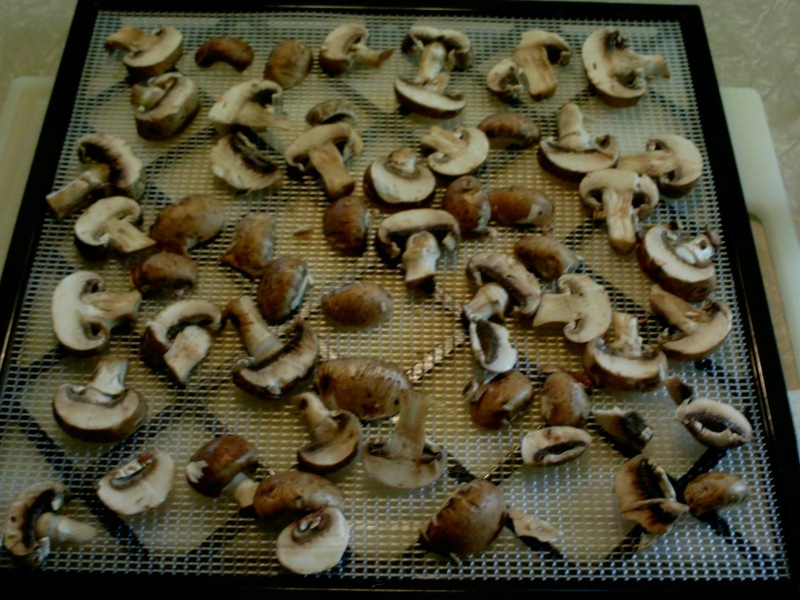 Set out 2 9x13 pans or rimmed cookie sheets. Mix wet ingredients (include the brown suger here if that's your sweetener of choice) in small bowl, then pour over dry ingredients and stir until evenly coated. Spread out onto pans and bake about 30 minutes, checking for doneness and stirring every 10 minutes or so. 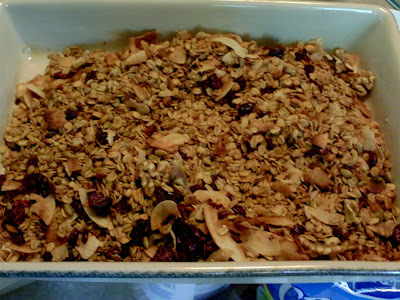 When the granola looks nice and toasted (hubby would even venture to say "just a little burnty" because that's how he likes it, lol), take it out of the oven to cool. Throw your dried fruit in and mix it up. Add the nuts, if you choose. Cool thoroughly and store in airtight container. After my last (sad) update, I wanted to update again. Interestingly, looking back at previous years' blog posts, August 17 or so is the day that I really started complaining about fall allergies, both this year and last year. Something to take note of. I re-evaluated my hayfever problem and have made some changes around the house to hopefully help me out this season. 1. I am continuing the Gluten- and Tomato- free thing, especially through the end of this allergy season. I am also avoiding cucumbers and melon (and zucchini), as they are associated with Ragweed allergy and can cause problems similar to hayfever when consumed during Ragweed season (Oral Allergy Syndrome). Just because I've had that problem in the past and know I am still struggling with hayfever....trying to give my body the best chance to NOT increase the "bad" things it has to deal with. 2. I have closed nearly all windows in the house. I'd prefer to let the cool night air in to cool the house off, rather than torture us with hot rooms to sleep in....but for now, the (clean) fans are working 'good enough'. 3. I have made our bedroom an Allergy Safe Zone. I took off ALL of the covers and pillows from the bed and washed them on HOT and dried them thoroughly in the dryer. As I was taking the pillow cases off of the pillows, I had a sneezing fit. A couple of our pillows' allergy covers are worn out/holey and I need to replace them. I have also mandated that we each need to take a shower before going to bed---no bringing pollen from being outside into the bedroom! After my sneezing fit when handling the pillows, I really think my "Allergy Tank" was overflowing when I was trying to sleep in my pollen-doused room/bed. Even I wasn't showering every night (tsk-tsk)...the pollen built up over a couple days on our pillows and bedding---pollen that was stuck to our hair after walking around outside in the garden/fields. I wasn't getting the rest I needed to recuperate at all, and it was having a snowball effect. Weird. Especially since today's allergy level on Pollen.com is even higher--a 10.6 on a 12 point scale. Maybe finally taking these precautions is actually helping. So anyway, yesterday and today so far I have only taken my homeopathic and used my Neti Pot once or twice. It's supposed to get HOT today...we'll see how it goes from here on out. I don't know why, but whenever I use "regular" toothpaste, my teeth decide to go all sensitive on me. Whitening toothpastes are especially horrible for causing this, but I am talking about the regular toothpaste doing this! When I was first diagnosed with multiple food allergies (13+), I was told by my allergist to avoid all of my allergens and their botanical families. Sheesh, was that a hard thing to do! This knocked out every toothpaste that I could buy at any local store (not to mention other run-of-the-mill personal care products). They all contained corn, soy, and/or coconut(sodium lauryl sulfate, anyone?). So, I was down to using baking soda and salt. And guess what? My sensitive teeth miraculously became not-sensitive! And without the use of Sensitive Teeth toothpaste! I have no explanation as to how or why, but that is what happened to me. I'm open to any ideas. 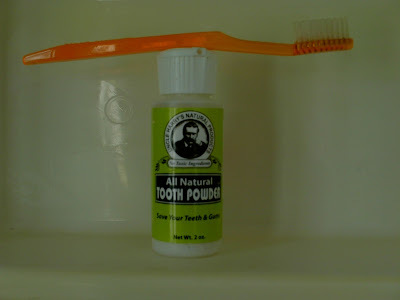 Now that I am doing better food-wise, I can use pretty much any toothpaste. But, I still get the sensitive-teeth issue if I use regular(or natural, for that matter) toothpaste on a regular basis. 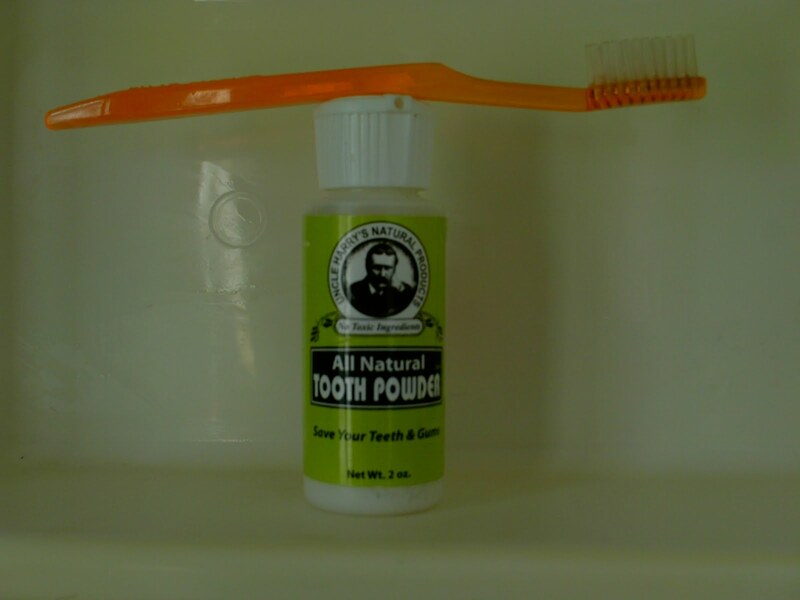 Enter Uncle Harry's All-Natural Tooth Powder. I picked this up at Lehman's last spring on a whim. (love that place!) And I have been using it ever since. 1. It cleans much better than any paste that I have used. 3. It doesn't contain tons of chemicals and unpronounceable ingredients. 4. As far as I can figure, it does NOT contain Gluten, Corn, or Soy.